Special Price of just $15. 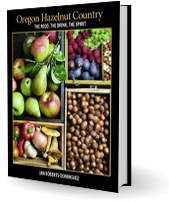 Popular Oregon food columnist and cookbook author Jan Roberts-Dominguez inspires with over 150 recipes for savoring this delectable nut in her new release, Oregon Hazelnut Country. From casual appetizers and unique side dishes to elegant entrees and desserts, you will see how wonderfully simple it is to enjoy Oregon hazelnuts. This beautiful book, adorned with Jan’s original watercolors and photography by Karl Maasdam, also features a look at the local hazelnut industry and some of the marvelous people responsible for producing the best hazelnuts in the world.